Instantly identify change of address moves and update your database records with the new addresses. Maximize the number of new addresses applied to your records when processing your mailing list against the full 48 month NCOALink file from the USPS. Locate individuals, families, and businesses who have completed a Change of Address form with the USPS. Speed-to-market and information accuracy are critical to your marketing campaign’s success. The UpdateYourList.com DIY Portal allows you to instantly process your database records against the USPS 48-Month, or 18-Month, National Change Of Address (NCOALink) file to receive change of address information for your customer and prospect records who have moved. Over 60 million people and businesses in the United States move every year, and without proper maintenance your database and customer records can quickly become outdated. 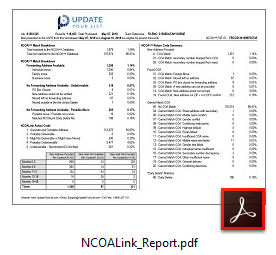 What is the NCOALink Processing Acknowledgement Form (PAF)? The Processing Acknowledgement Form (PAF) is a requirement of the U.S. Postal Service. It is to ensure that NCOALink is used only for the purposes of mailing. All NCOALink vendors are required to have a completed and signed PAF provided by the list owner. In no case may a broker, agent, or third party sign as the list owner. Mailing lists cannot be processed until we receive a completed and signed PAF. What is the difference between 18-Month and 48-Month NCOALink processing? 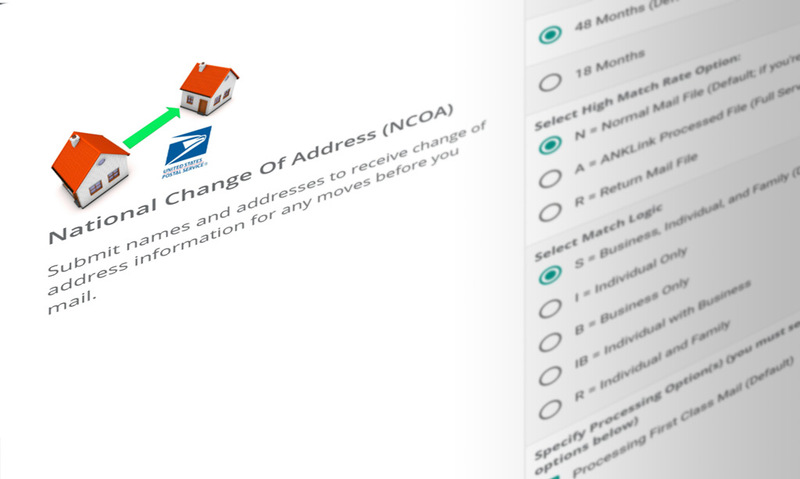 The difference between 18-Month and 48-Month processing is the number of months of change of address data that is available. Depending on the last time your data was processed through NCOALink you may only need 0-18 month moves. If the list has never been processed through NCOALink, 48-Month processing is recommended since it will also return 19-48 month moves. Where does the NCOALink data come from? The U.S. Postal Service is responsible for creating and maintaining the NCOALink file. Moves are reported by individuals, families, and businesses who have completed a change of address form. What is the turn-around time for NCOALink processing? When opting for real-time processing, the DIY Portal can process 10,000 records per minute. 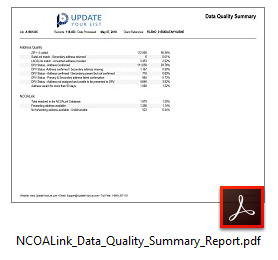 How often is the NCOALink data file updated? The NCOALink database is updated weekly. Change of address requests are kept for 48 months / 4 years. How often should I process my database through NCOALink? To qualify for postage discounts it's required that you update your files every 95 days. Therefore, many users update their lists, database, and/or mail files every 2 to 3 months. What is the difference between the standardized address columns (std_line1, etc.) and the change of address columns (coa_line1, etc.) that are returned in the NCOALink output results? The STD address lines are the standardized version of the address. The COA fields contain the change of address data for the new address output from the NCOA database. The new address data in the COA fields should be used first, and when there is no COA data present then the STD address data should be used as that data is a properly formatted and standardized version of the address. What is the difference between NCOALink and DSF2 (Delivery Sequence File)? NCOALink is a process that matches a file of names and addresses to the USPS licensed NCOALink database comprised of 160+ million records of individual, family, and business moves. DSF2 is a USPS licensed database that improves delivery of your mailings by examining address data and comparing it to the DSF2 database that contains each of the 145+ million delivery points. DSF2 confirms the existence of the address, provides delivery type, business versus residential, and provides a Pseudo Sequence Number to qualify for walk sequence postal presort discounts. DSF2 detects potentially undeliverable addresses for reasons other than Change Of Address (COA). If DSF2 is what you need instead of NCOALink, we also offer DSF2 Processing. 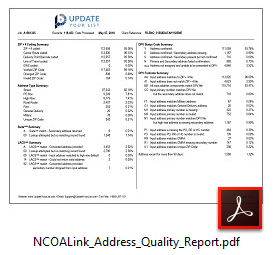 What is the difference between NCOALink and PCOA (Private Change of Address)? When people move and change addresses, not everyone completes and registers this Change Of Address (COA) with the USPS. Without this registration, the move is not recorded in the NCOALink database, and therefore no forwarding address can be provided. However, by using PCOA services we can search beyond the boundaries of NCOALink alone. The PCOA database is compiled from multiple private sources, such as magazine publishers and credit card companies. Often these companies will receive change-of-address notifications that are not reported to the USPS. This allows you the opportunity to update your database and stay in contact with your customers who might otherwise become undeliverable records on your marketing database. It is always recommended that you run PCOA (Private Change of Address) in conjunction with NCOALink, rather than as a standalone service. NCOALink is still the best method to capture the most moves and is required in order to meet the USPS Move Update Requirements. What are the NCOALink Return Codes? All records processed through NCOALink will receive a return code. This return code will provide you information about what NCOALink type of match was found for each record. The input record matched to a business, individual, or family type master file record. A new address from NCOALink is returned. The input record COULD NOT BE matched to a NCOALink master file record. A new address from NCOALink could not be furnished. This return code may be returned regardless of the NCOALink processing mode, matching logic, or Change Of Address (COA) type. The input record matched to a business, individual, or family type NCOALink master file record but the new address was outside the USPS delivery area. This return code may be returned regardless of the NCOALink processing mode, matching logic, or Change Of Address (COA) type. The input record matched to a business, individual, or family type NCOALink master file record and the new address was not provided to USPS. This return code may be returned regardless of the NCOALink processing mode, matching logic, or Change Of Address (COA) type. 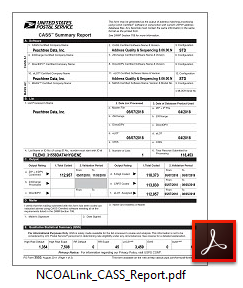 The input record matched to a business, individual, or family type NCOALink master file record which contains an old address or PO BOX that has been closed without a forwarding address provided. This return code may be returned regardless of the NCOALink processing mode, matching logic, or Change Of Address (COA) type. In the STANDARD mode utilizing Family matching logic the input record matched to a family record type on the NCOALink master file with an old address that contained secondary information which obtained a ZIP + 4 street level match. The input record does not contain secondary information. This address match situation requires individual name matching logic to obtain a NCOALink match and individual names do not match. The input record matched to a business, individual, or family type NCOALink master file record. 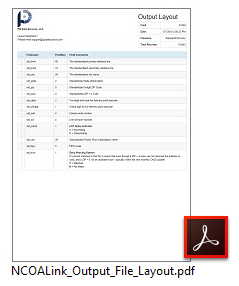 The new address on the master file record could not be converted to a deliverable address because the Delivery Point Barcode (DPBC) represents more than one delivery point. This return code may be returned regardless of the NCOALink processing mode, matching logic, or Change Of Address (COA) type. There is more than one Change Of Address (COA) (individual or family type) record for the match algorithm and the middle names or initials on the COAs are different. Therefore, a single match result could not be determined. This return code is only obtained when using NCOALink individual matching logic. There is more than one Change Of Address (COA) (individual or family type) record for the match algorithm and the genders of the names on the COAs are different. Therefore, a single match result could not be determined. This return code is only obtained when using NCOALink individual matching logic. The input record matched to two master file (business, individual or family type) records. The two records in the master file were compared and due to differences in the new addresses, a match could not be made. This return code may be returned regardless of the NCOALink processing mode, matching logic, or Change Of Address (COA) type. The input record matched to a family record on the master file from a High-Rise address ZIP + 4 coded to the building default. This address match situation requires individual name matching logic to obtain a match and individual names do not match on the NCOALink file. The input record matched to a family record on the master file from a Rural Route or Highway Contract Route address ZIP + 4 coded to the route default. This address situation requires individual name matching logic to obtain a match and individual names do not match on the NCOALink file. 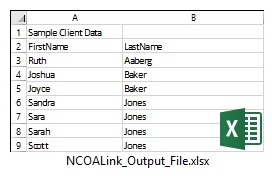 There is a NCOALink master file (individual or family type) record with the same surname and address but there is insufficient name information on the NCOALink master file record to produce a match using individual matching logic. This return code is only obtained when using individual matching logic. The input record matched to an individual or family record on the NCOALink master file with the same address and surname. However, a match cannot be made because the input name contains a conflict with the middle name or initials on the NCOALink master file record. This return code is only obtained when using individual matching logic. The input record matched to a NCOALink master file (individual or family type) record. A match cannot be made because the gender of the name on the input record conflicts with the gender of the name on the NCOALink master file record. This return code is only obtained when using individual matching logic. The input record matched to a NCOALink master file (business, individual, or family type) record. The new address could not be converted to a deliverable address. This return code may be returned regardless of the NCOALink processing mode, matching logic, or Change Of Address (COA) type. There is a NCOALink master file record with the same address and surname. A match cannot be made because the input record does not contain a first name or contains initials only. This NCOALink return code is only obtained when using individual matching logic. The input record matched to a street level individual or family type NCOALink record. However, a match is prohibited based on 1 of the following reasons: 1) There is conflicting secondary information on the input and NCOALink master file record; 2) the input record contained secondary information and matched to a family record that does not contain secondary information. In item 2, this address match situation requires individual name matching logic to obtain a Change Of Address (COA) match and individual names do not match. The input record matched to an individual or family NCOALink master file record. The input name is different or not sufficient enough to produce a match. This NCOALink return code is only obtained when using individual matching logic. The input record matched to a family record on the NCOALink master file from a General Delivery address. This address situation requires individual name matching logic to obtain a NCOALink match and individual names do not match. There is a NCOALink change of address on file but the new address cannot be ZIP + 4 coded and therefore there is no 11-digit Delivery Point Barcode (DPBC) to store or return, the new address primary number cannot be confirmed on Delivery Point Validation (DPV) or the new address is temporary. This NCOALink return code may be returned regardless of the processing mode, matching logic, or Change Of Address (COA) type. Multiple NCOALink master file records were potential matches for the input record. The NCOALink master file records contained different new addresses and a single match result could not be determined. This NCOALink return code may be returned regardless of the processing mode, matching logic, or Change Of Address (COA) type. The input record matched to a business, individual, or family type master file record with an old address that is present in the NCOALink daily delete file. The presence of an address in the NCOALink daily delete file means that a COA with this address is pending deletion from the NCOALink master file and that no mail may be forwarded from this address. This NCOALink return code may be returned regardless of the processing mode, matching logic or Change Of Address (COA) type. The input record matched to a NCOALink master file record. The NCOALink master file record had a secondary number and the input address did not. The input record matched to a NCOALink master file record, but the input address had a secondary number and the NCOALink master file record did not. The record is a ZIP + 4 street level match. What does it cost to process NCOALink through the DIY Portal? To process 48 Month NCOA it costs $1.70 for every 1,000 records ($0.0017 per record). To process 18 Month NCOA it costs $1.40 for every 1,000 records ($0.0014 per record).